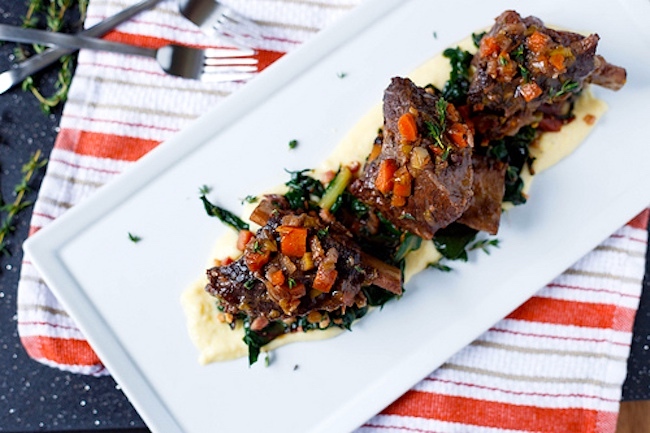 An offshoot of investigations into Swiss Steak: three recipes for braised shortribs (or short ribs) with Swiss chard, one of them from the restaurant of the Swiss Hotel in Sonoma CA. Braised shortribs and Swiss steak are both braised beef dishes, but Swiss steak is boneless, is standardly pounded flat before searing and stewing, and is often cut into pieces before cooking; otherwise, the dishes are very similar. Meanwhile, Swiss chard (aka chard and several other things) isn’t Swiss either, certainly not by origin, though the details of its association with or relationship to Switzerland are not at all clear — perhaps only by its being a everyday green vegetable throughout the country (in a way that it is not in the US or the UK). 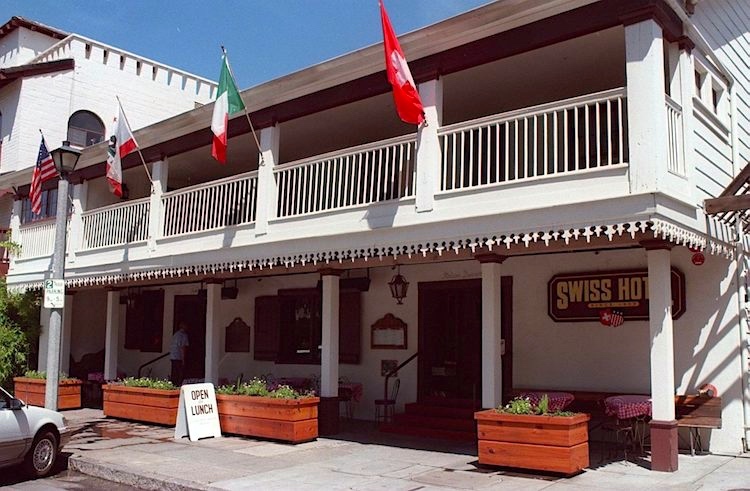 The Swiss Hotel in Sonoma (serving Italian / American food) isn’t Swiss, either, but it is historically related to Switzerland, in particular to Italophone Switzerland in the 19th century. The pairing of braised shortribs (not in itself a particularly Swiss dish) with Swiss chard on several occasions, once from a restaurant with Swiss associations, might suggest an association between Switzerland and braised meat, braised beef in particular — a relationship that could help to account for the Swiss of Swiss steak. Preheat oven to 350°F. Place [6 pounds 3-inch-long meaty beef short ribs] on rimmed baking sheet; sprinkle with coarse salt and pepper. Sprinkle flour over; toss to coat. Heat 1/4 cup oil in heavy large wide pot over medium-high heat. Working in batches, cook ribs until browned all over, about 10 minutes per batch. Return to sheet. Wipe out pot. Add remaining 1/4 cup oil to pot. Add [3 cups chopped onions. 3 3/4 cups cubed peeled turnips, 2 cups chopped peeled carrots, 2 cups chopped celery, 8 garlic cloves, peeled]; cook until tender and slightly browned, stirring often, about 12 minutes. Add [1/4 pound sun-dried tomatoes, 1/4 cup fresh thyme sprigs, 5 large fresh sage sprigs, 5 bay leaves]; stir to coat. Return ribs to pot, placing on sides to fit in single layer. Add [2 cups red wine]. Simmer until slightly reduced, about 5 minutes. Add [4 cups chicken] broth; cover and bring to simmer. Transfer pot to oven and braise until ribs are tender, about 2 hours. Let stand, covered, at room temperature 15 minutes. Carefully transfer ribs to large bowl, keeping meat attached to bones if possible (some bones may separate from meat). Remove herb sprigs. Pass all braising liquid and vegetables through food mill into large bowl; return to pot. Spoon fat from surface. Season gravy to taste with salt and pepper and a few drops of balsamic vinegar, if desired. Rewarm gravy. Return ribs to gravy; cover and simmer to rewarm, about 5 minutes. Swiss chard [2 pounds, ribs removed, cut into ribbons]: Heat oil in large pot over medium-high heat. Add [4 thinly sliced garlic cloves]; stir 30 seconds. Add half of chard; toss to wilt, adding water by tablespoonfuls if dry, about 1 minute. Add remaining chard. Toss until wilted but bright green, about 3 minutes. Season to taste with salt and pepper. Divide ribs among plates. Divide chard among plates. Spoon gravy over ribs and serve, passing remaining gravy alongside. Between 1836 and 1840, the General’s Brother, Don Salvador Vallejo, built his family home in the middle of the block on the north side of the Plaza. That beautiful adobe structure still stands today. As a hotel, the home is said to have served as a stagecoach stop in the 1870’s. In 1892 it was acquired by the Toroni family and run as the Ticino Hotel [after the Italophone canton of Switzerland from which the family came], serving railroad passengers and employees who stopped in Sonoma to spend the night. When another hotel on the west side of the Plaza burned to the ground, the Toronis simply took its name for their own, and to this day the Vallejo home is known as the Swiss Hotel. The canton of Ticino, formally the Republic and Canton of Ticino, is the southernmost canton of Switzerland. Ticino borders the canton of Uri [Germanophone] to the north, the canton of Valais [Francophone] to the west (through the Novena Pass), the canton of Graubünden [Grisons, Swiss ski-land, with German, Italian, and Romansh speakers] to the northeast, Italy’s regions of Piedmont and Lombardy to the south, and it surrounds the small Italian enclave of Campione d’Italia. 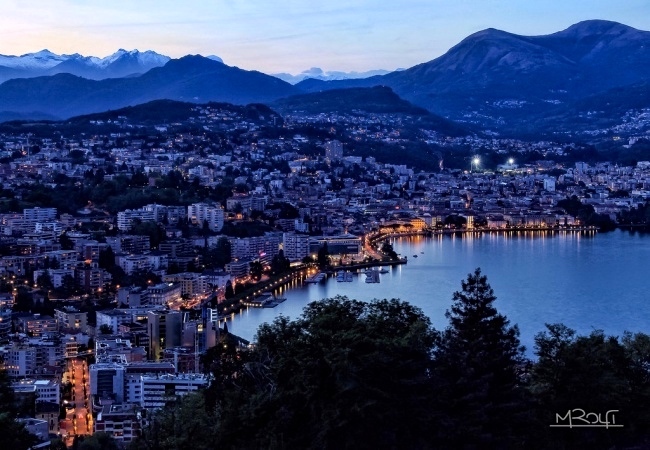 Named after the river Ticino, it is the only canton where Italian is the sole official language and represents the bulk of the Italian-speaking area of Switzerland, along with the southern parts of Graubünden. This entry was posted on July 15, 2018 at 3:18 pm and is filed under Language and food, Language and plants, Names. You can follow any responses to this entry through the RSS 2.0 feed. You can leave a response, or trackback from your own site. “Swiss chard” (French côtes de bette, German Mangloldblätter, Rumantsch Grischun urtais, Surmiran mangold) is the crucial ingredient (as wrapper) in one of the most distinctive dishes of the Rumantsch speaking parts of Graübunden, capuns. I have two cookbooks with nothing but recipes for capuns, hundreds of different variations. The WordPress site really needs something like a LIKE button. Or a THANKS emoji. The story I’ve heard is that the term Swiss chard derives from a derogatory usage of Swiss (similar to Dutch courage), in this case where chard stands for cardoon (chardon). The implication is that the stems of the chard (more prized in traditional European cuisine than the greens) were the poor person’s substitute for cardoon. I’d love to hear if there’s any justification for that or if it’s just creative folk etymology. New to me, and I’m suspicious of it.